This isn’t the first time we’ve heard about the wooden backs for the Moto X. We’ve seen the wood backs for Moto X leaked on several occasions in the past, with one vague “coming soon” statement from many sources. Even Motorola CEO Dennis Woodside mentioned in an interview with Marques Brownlee that new material options will be available soon. Earlier today, @evleaks also leaked another image of the Moto X with a wood back, and another interesting thing: a Verizon logo. The notorious @evleaks said, “They are still coming.” This isn’t anything knew, we’ve heard this statement since the handset made its first official appearance. Many rumors mentioned that it’s going to hit the shelves during the holiday season, possibly by the end of this month. 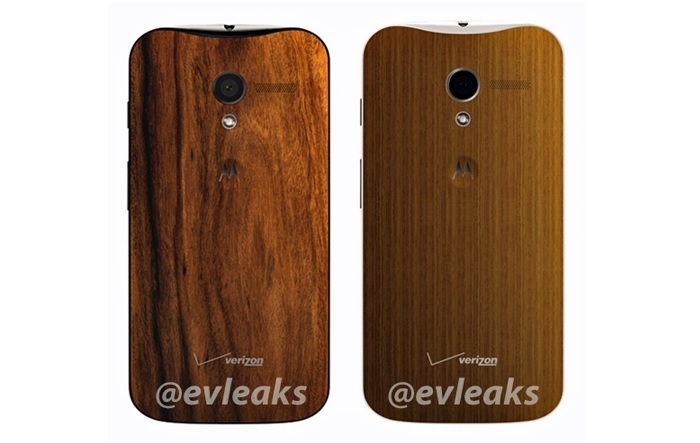 And, with the Verizon logo on the wood back, we’re assuming that the customization will be available on all major carriers. Not too long ago, Motorola launched the Moto Maker customization for all major carriers in the US, and similarly, these customizations should hit other carriers too. It was rumored that the wood back customizations will not be free and will come with an additional $50 price tag. They are said to be available in teak, rosewood, bamboo and ebony. Let’s hope the company can roll out the wood customization in time.